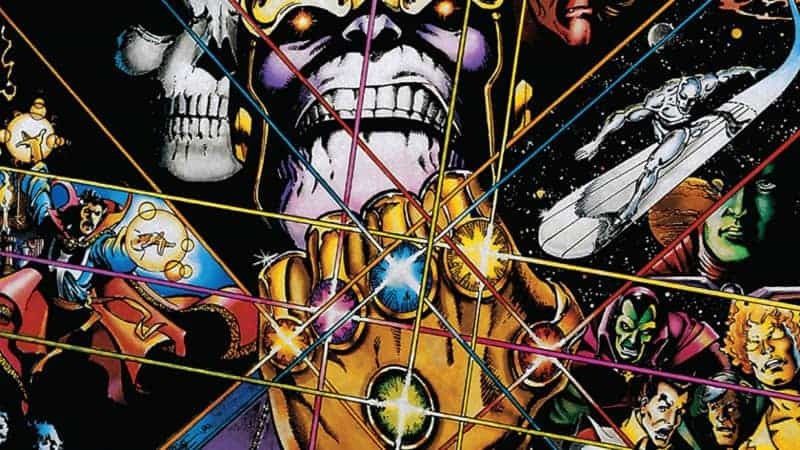 With AVENGERS: INFINITY WAR right around the corner, we here at ComicsVerse decided to list our favorite Marvel cosmic events. Marvel’s cosmic books make up some of the most memorable comics published in the history of superhero books. 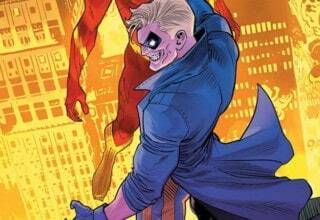 Of course, where there’s superhero books, big crossover events aren’t far behind. It doesn’t hurt that some of Marvel’s most well-written events happen to also be cosmic books. From the first big Thanos crossover to the spacefaring INFINITY event, Marvel has a wealth of fantastic cosmic events. Please note: these events are listed in chronological order, not in any formal ranking. Let us know below which cosmic events are your favorites! Our first Marvel cosmic event, from 1978, is one of the earliest, and greatest, extended cosmic story arcs. It takes place in the pages of AVENGERS #167-177. Korvac first appears as a cyborg from an alternate future in the pages of DEFENDERS, and soon finds his way to Earth 616, where he gains the Power Cosmic. Now nearly omnipotent, he hides out in Queens to deploy his plot to take over the Earth and transform it into his perfect version. 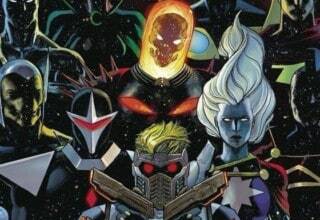 The original Guardians of the Galaxy (Starhawk, Yondu, Charlie-27, Martinex, Vance Astro and Nikki) track Korvac down after coming to the 20th century (they fought him before when he was a cyborg). He evades the Guardians but is then preyed upon by the Collector. The Collector sends his daughter, Carina, to defeat him, but she ends up falling in love. She leads Korvac back to the Collector and Korvac kills him (for the time being). They both settle down back in Queens and attempt to live among the Earthlings once again. The Guardians, aided by the Avengers, track him down again and face him. He kills nearly every hero, which starts to scare his new beau. In a moment of lucidity, Korvac is overcome with grief and remorse and commits suicide after bringing back all the killed heroes. This is a bizarrely downbeat ending to this gigantic ten-issue-long crossover. After an adventure where Captain Marvel tricks Thanos into giving up the Cosmic Cube (or the Tesseract to you MCU buffs), the big purple guy returns in our next Marvel cosmic event, from 1976-77. Starting in issues of WARLOCK, Thanos concocts a plan to appease his true love, Death, by collecting the “soul gems” (later known as the Infinity Gems). He collects five of them, with only one remaining: the one embedded in Adam Warlock’s forehead. During this storyline, we meet Gamora. We see Thanos “adopt” Gamora from the slaughtered Zen-Whoberis. 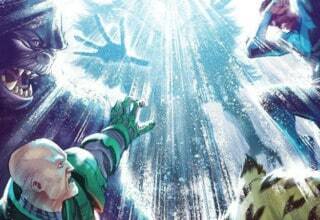 After a convoluted plan to change history and stop Warlock from becoming his evil counterpart, The Magus, Thanos gains possession of Warlock’s gem. MARVEL TWO-IN-ONE ANNUAL #2. 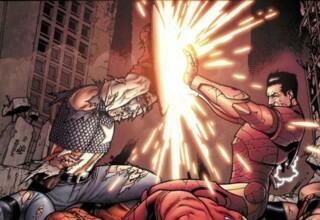 Image courtesy of Marvel Entertainment. Eventually, the story culminates in AVENGERS ANNUAL #7 and MARVEL TWO-IN-ONE ANNUAL #2. Thanos creates one gigantic Soul Gem and plans to snuff out all the stars in the universe to appease his love. In the process, he seemingly kills the traitorous Gamora. Warlock, with the aid of the Avengers, the Thing, Spider-Man and other heroes, take the fight to Thanos’ lair. After a climactic battle, Warlock gains the upper hand. He turns Thanos into stone. Thanos would remain this way until the lead-up to our next event. INFINITY GAUNTLET #1. Image courtesy of Marvel Entertainment. Our third Marvel cosmic event is arguably the most well-known. If you haven’t read it, but you’re reading this, chances are you’ve at least heard of it. The book that inspired the basic plot of AVENGERS: INFINITY WAR, INFINITY GAUNTLET, begins in issues of SILVER SURFER with Death transforming Thanos back into a living being. She explains that life in the universe is growing unchecked, and half of that life must be snuffed out to restore balance. Thanos obliges his love and once again seeks out the Infinity Gems. He collects them all in the THANOS QUEST miniseries. This time, he builds a gauntlet to hold their power. Death, unimpressed, still spurns Thanos’ advances until he fulfills his task. So, Thanos, with a snap of his Infinity Gauntlet-clad fingers, wipes out half of all life in the universe. Soon after, Adam Warlock helps Dr. Strange round up some of the remaining heroes. They go to fight Thanos and he wipes them out with great ease. Warlock and Silver Surfer, still alive, try to battle Thanos, with help from Death and Mephisto and other cosmic beings, but Thanos defeats them all as well. As a result, Thanos essentially becomes Eternity and leaves his physical body. Meanwhile, Nebula steals the Gauntlet from Thanos’ corporeal body and nearly kills him. With help from Dr. Strange and Warlock, Thanos agrees to defeat Nebula, since he never believed he was worthy enough to wield the Gauntlet in the first place. Thanos convinces her to return everything he destroyed, and as she’s being attacked by the revived entities, Warlock steals the Gauntlet and transports the heroes back to Earth. Warlock forms a team of intergalactic beings (Including Thanos!) called the Infinity Watch to make sure no one evil gets ahold of the six gems again. Our next Marvel Cosmic Event (we decided to group these two together since they’re almost intertwined) occurs 15 years after the events of INFINITY GAUNTLET. Annihilus, a despot from the Negative Zone, gathers an overly powerful army of warships and begins an attack on the Marvel Universe. He destroys Xandar and leaves Richard Rider as the sole living Nova, now dubbed Nova Prime. 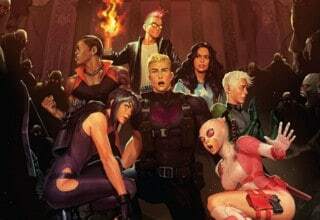 Almost a year after this attack Nova gathers together a ragtag team of cosmic heroes, including Drax, Ronan, and Star-Lord. They discover that Annihilus, with help from Thanos, has imprisoned Galactus and the Silver Surfer and plans to use them as weapons. After tracking them down, Drax kills Thanos and they free the imprisoned duo. Using Galactus, they destroy 2/3 of the Annihilation Wave. Nova eventually kills Annihilus, which ushers in a new era of cosmic events. One year after the Annihilation Wave surrenders, the Phalanx, a group of techno-organic X-Men villains, attempt to take over the Kree. The Phalanx, led by Ultron, take control of multiple cosmic heroes, including Drax, Gamora, and Nova. Star-Lord and a team of intergalactic misfits, including Groot and Rocket Raccoon, infiltrate a major Phalanx stronghold. Meanwhile, Quasar and Moondragon visit Adam Warlock and convince him to help fight off Ultron. He tries, but Ultron takes over his body in the process. After Star-Lord’s team destroys the stronghold, Adam Warlock returns (it turns out his essence was transported to Quasar’s gauntlets) and, with help from Quasar, defeats Ultron. Unfortunately, a major cosmic hero dies in the process. If you’re a fan of the Guardians of the Galaxy, take note: ANNIHILATION CONQUEST marks the first appearance of the team that would inspire the two films! After the events of ANNIHILATION and its sequel comes our next Marvel Cosmic Event. Before WAR OF KINGS, Black Bolt and Medusa of the Inhumans became the rulers of the Kree Empire. 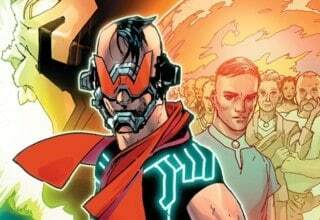 At the same time, Cyclops and Havok’s long-lost evil brother, Vulcan, reappears after years of being thought dead and takes control of the Shi’ar Empire. Vulcan wants to make the Shi’ar the rulers of the universe, and he starts by attacking the Kree. The Shi’ar Gladiator and his Imperial Guard make the opening salvo, and almost kill Ronan before being incapacitated by Black Bolt. They retreat, but not before capturing Princess Lilandra, a Shi’ar expat. Thus starts the War of Kings. 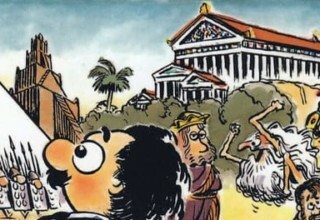 WAR OF KINGS SAGA #1. Image courtesy of Marvel Entertainment. The Nova Corps side with the Kree and try to battle the Shi’ar, but fail miserably. Gladiator faces a crisis of conscience as he debates either following his sworn oath to serve the emperor, or save his own sister, Lilandra, from Vulcan’s clutches. Following a botched rescue attempt by members of the Guardians of the Galaxy, Lilandra finally gets through to Gladiator and he switches allegiances. Unfortunately, Lilandra dies soon after at the hands of a Shi’ar Raptor named Razor. As Gladiator goes into a mindless frenzy, picking off multiple Shi’ar ships, Black Bolt and Vulcan battle each other one-on-one. The ship they’re battling on is seemingly destroyed, and both kings are believed dead. As Medusa takes control of the Kree Empire, Gladiator takes control of the Shi’ar. He orders his empire to surrender, ending yet another cosmic event on a down note. Writer Jonathan Hickman brings the Avengers back to space in our final Marvel Cosmic Event. In INFINITY, the Earth is assaulted by two separate enemies. First, the Builders, an ancient alien race, seek to destroy Earth because they see it as an “imperfect” planet. The Avengers take to the stars to warn the Galactic Council of the incoming threat, which could harm their planets as well on its destruction path towards Earth. Meanwhile, Thanos, with help from his Black Order, a collection of violent alien beings, comes to Earth after learning that most of the planet’s most powerful beings are off planet. He seeks to gather the hidden Infinity Gems. Captain America successfully unites the council in opposition to the Builders, but their plan goes horribly wrong, and the Builders take control of multiple alien planets. INFINITY #6. Image courtesy of Marvel Entertainment. Meanwhile, Thanos travels to Attilan to find his long-lost Inhuman son. Black Bolt refuses to help and detonates a Terrigen Bomb to incapacitate Thanos, thus sending a Terrigen cloud to Earth, affecting many of its inhabitants. In space, Thor leads an insurrection to defeat the Builders who control Hala, which leads other planets to do the same. Eventually, the Avengers successfully defeat the Builders, but they soon learn of Thanos’ shenanigans. They arrive on Earth as Thanos meets his son, Thane. The Avengers, with help from Ronan, defeat members of the Black Order, but are almost felled by Thanos himself. One member, Ebony Maw, sees the defeat around him and has a change of heart. He orders Thane to encase Thanos in amber, mirroring his defeat in the original Thanos saga. These events led to major changes in both the Marvel Universe and the MCU. The original Thanos quest introduced the Infinity Gems. INFINITY GAUNTLET made them into the powerful relics they’re known as today. It inspired countless writers, including Jonathan Hickman, Brian Michael Bendis, and Gerry Duggan to write some of the greatest Marvel books. Not to mention that this book, along with its sequels INFINITY WAR and INFINITY CRUSADE, plus INFINITY, led to a certain hotly-anticipated MCU: AVENGERS: INFINITY WAR! Plus, ANNIHILATION and ANNIHILATION CONQUEST led to the modern cosmic golden era. 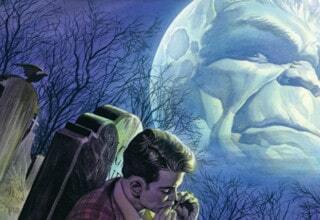 It made Richard Rider, an almost forgotten teen hero, into an A-list heavy hitter in the Marvel U. And, of course, it introduced the modern iteration of the Guardians of the Galaxy, headlining both the new cosmic era and two smash hit films. We love the books both for their quality as well as for their importance in comic book history! 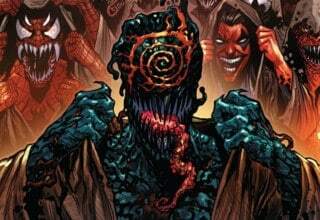 What’s Your Favorite Marvel Cosmic Event? You read our favorites, but this list doesn’t include every Marvel Cosmic Event. Are you an INFINITY WAR fan? Do you live for THE THANOS IMPERATIVE? Let us know which events you love in the comments or on social media!